The New York International Auto Show opens to the public on Friday, marking the end of the annual auto show season that began in Paris in the fall. Close to 20 different manufacturers will stage major debuts this year, from a family-friendly Porsche to a Bugatti expected to cost as much as $4 million. The Acura TLX sedan is back in the Big Apple, having made its debut in 2014. But Honda’s luxury brand is polishing this apple by introducing a special edition, the TLX PMC. It’s a bespoke version that will be largely hand built at the same, special production center that handles Acura’s two-seat supercar, the NSX. Priced at around $50,000, the TLX PMC will feature a high-performance version of the marque’s VTEC V-6 driving power to all four wheels through the Acura Super-Handling All-Wheel-Drive system. Volkswagen’s biggest luxury brand has an assortment of announcements, including a new version of its compact Q3 crossover, as well as updates of the TT RS sports coupe, and the R8 supercar. All versions of the R8 will now be able to top 200 mph. The two-seater also will break the $200,000 barrier with the introduction of the limited-edition Decennium model. Meant to celebrate the 10th anniversary of the R8 line, only 500 copies will be brought to the U.S., at a price of $216,245 each. One of the most exclusive brands in the world, Bugatti produces barely one car a week, but it has been adding a series of special editions that are more powerful and more exclusive. The latest is a version of the Chiron Sport meant to mark the marque’s 110th anniversary. Though the brand may be owned by Germany’s VW, Bugatti loves to emphasize its roots by, among other things, incorporating the French tricolor on this model’s mirror caps. The 280 mph hypercar is expected to be priced around $4 million. Like most manufacturers, Cadillac is rolling out an assortment of new SUVs, such as the XT4 that debuted at last year’s NYIAS. But the brand remains “very much committed to sedans,” said Cadillac President Steve Carlisle, and it plans to prove that with the launch of the new CT5m which features a new take on the Art & Science design theme that has made Cadillac a visual standout. The brand bills the CT5 as a “driver’s car,” with the sort of performance and handling you can rarely get out of a tall and boxy SUV. The Swedish carmaker has a history of pushing the limits, and the new Jesko is no exception. Able to punch out 1,578 horsepower and 1,160 pound-feet of torque, it will become one of the world’s fastest and most powerful vehicles, with a top speed claimed to reach around 300 mph. Named after the father of the company’s founder, it is envisioned as more of a grand tourer, with more precise handling than the current Koenigsegg speed king, the Agera. Like its cross-town rival, Cadillac, Ford’s Lincoln brand has been struggling to rebuild its once-formidable reputation. It is winning kudos with a series of new crossover-utility vehicles, such as the big Aviator that debuted in New York last year. The Corsair is its downsized sibling and replaces the old Lincoln MKC. Though small, the Corsair is expected to be loaded with upscale features. There’s a growing market for limited editions and other exclusive products, and Fiat Chrysler’s Maserati brand aims to burnish its image with a new program, dubbed One of One, that will allow customers to extensively customize their vehicles. Not surprisingly, the customization program will begin with a special Levante SUV featuring an exclusive interior designed by Italy’s fashion house Ermenegildo Zegna. Mercedes is introducing eight new models in New York, including four AMG offerings, such as the CLA 35. The basic CLA has become a compact design icon with its distinctive, coupe-like shape. Now, add a 302-horsepower twin-turbo engine that will launch it from 0 to 60 in 4.6 seconds. The CLA 35 will also feature Mercedes’ new voice assistant. There are plenty of skeptics when it comes to battery-electric vehicles, but resistance is fading among performance fans, and the Pininfarina Battista underscores why. The stunning shape was developed by one of the world’s most well-respected design houses. For power, the Italians reached out to Rimac, a Croatian start-up specializing in electric drive technology. 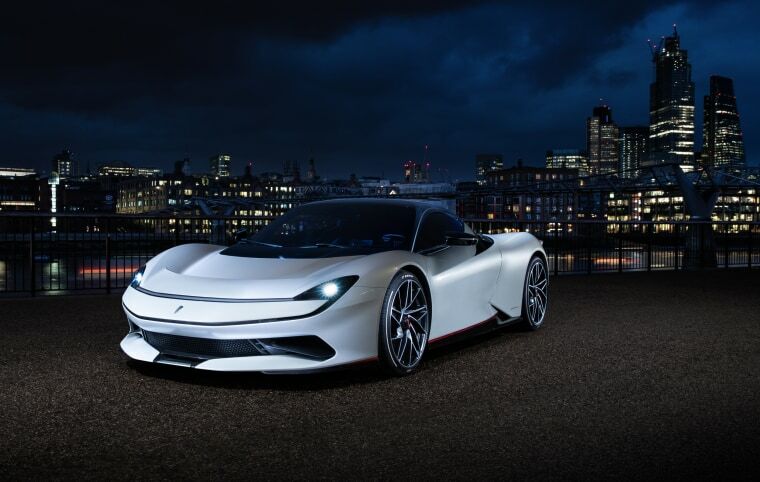 Named for Pininfarina’s founder, the Battista 1,900 hp can hit 186 mph. It may be best known for sports cars like the 911, but Porsche defied the naysayers when it launched its original Cayenne SUV and followed up with the Macan, now its best-selling model. Like so many other luxury brands, it is adapting to a world in which sport-utility vehicles are rapidly taking the place of sports cars, and that means expanding the line-up with a more coupe-like version of the Cayenne. Britain’s Land Rover is rapidly expanding its line-up, especially among its most exclusive Range Rover family. With its 5.0-liter supercharged V-8 punching out a hefty 550 horsepower, this new version of the luxurious Velar will be able to hit 60 before you can get its name out of your mouth. To complement the performance upgrade, the Velar SVA features a new grille and bumper vents meant to improve engine breathing, as well as quad tailpipes and interior upgrades.